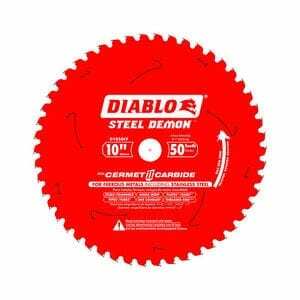 Which Type of Circular Saw Blade to Purchase? If you already own a circular saw, you definitely need a blade that goes with it. Whether you are getting one as a back-up, or as a replacement, making sure that you have the right blade is very important. With the number of options on styles and brands that are currently available out there, choosing the appropriate circular saw blade can be daunting. We understand this dilemma. As such, we have come up with this summary and review to help you make a wise purchasing decision. Circular saw blades go well together with a circular saw. If you are a woodworker or a carpenter who has found the benefits of using a circular saw, you also know by now that getting the right blade to go with it is very important. Several years back, I discovered the beauty of using a circular saw. The blade was fine until I realized that it needed a replacement. It could have been a wiser choice for me to get an extra blade. It could have not just lengthen the life of the first one, but it could have also served as a good back-up in order to complete more challenging tasks. Choosing the right type of circular saw blade to go with your circular saw is something that needs to be seriously taken into consideration. The Freud D1050X circular saw blade is equipped with features that make it a standout option for woodworkers and carpenters. Among the standout features include the use of laser cut stabilizer vents that work in trapping vibration and noise. The same feature also helps in keeping the blade cool, while reducing the possibility of experiencing blade warp. Its slots for laser cut heat expansion also enables the blade to expand further, keeping the cuts straight and true. The DEWALT DW3128P5 blade is constructed using tougher tungsten carbide which helps in making sure that the blades stay sharper for a longer period of time, with less sharpening in between. It also comes in a thin kerf design for smoother and faster cutting action. It also has a computer balanced plate which works in reducing vibration for enhanced accuracy and improved overall finish. Freud D0760X Diablo uses the manufacturer’s exclusive TiCo Hi-Density Carbide which is specifically designed for performing crosscutting applications. Its ultra-thin kerf design also makes possible easy and fast cutting, with minimum waste expected during the process. Among its special features is the incorporation of the anti-vibration technology which reduces noise while extending cutting life of the blade. Circular saw blades are a necessity for woodworkers or carpenters who own a circular saw. This type of equipment will not be able to function and operate without a blade. With the several options that are available on circular saws, it is very important to ensure that the right type of blade is selected. These circular saw blades are constructed using different types of materials, but all of them are carefully selected by manufacturers in order to produce the best possible output in cutting. There are also different sizes that are available, allowing users to choose the best one that will fit their needs. If you are still new to purchasing circular saw blades, you may have the idea that you can get one that fits all types of circular saws. This could have been great if true. However, there are actually several types of circular blades that you need to choose from. Knowing the right type will help you save yourself from the need to go back and forth after making a wrong purchase. These blades are those that are used typically to cut wood and its composites. When purchasing a standard circular saw blade, identifying the number of teeth will help in determining the type, speed, as well as the finish of the overall cut. Blades that have fewer teeth has the capacity to cut faster. On the other hand, those with more are expected to produce a finer finish. These turbo-rim blades are diamond blades that come with a serrated rim. This feature helps in cutting thicker materials such as concrete and brick. They also cut stronger compared to other models, not necessarily leaving a clean finish. These blades are also a sub-type of diamond edged blades which are designed to work on materials such as slates and tiles. Diamonds are attached to the edge, to allow for rough cutting, leaving an extremely clean finish. These blades are designed to cut through materials such as concrete and brick. Some models are ideal for metal-cutting. These blades do not have teeth. They cut using the abrasive material attached to the edges, such as silicon carbide or aluminum oxide. These blades come with a rim that is divided by gullets. These segments produce the most aggressive types of cuts. They can cut faster compared to other types, and has the capacity to deal with tough materials like concrete and brick. Choosing from the different types of circular saw blades can be quite confusing, especially for the untrained eyes. As such, we have come up with this guide in order to help you get familiarized with the features that you need to look for in circular saw blades. Typically, the more teeth the blade has, the finer, smoother the cut will be. However, circular saw blades with few teeth also offer some benefits, including a lower price and faster cutting capacity. The rake hook refers to the position of the hook the moment it gets in contact with the cutting surface. An angle that is positive points down to the direction of the wood surface, while removing waste material aggressively, thus resulting to faster yet rougher cuttings. Gullet refers to the space that is found in between the teeth. Its depth and size determines the amount of material that is cleared while the blade spins. This is a very important determining factor to consider. The higher the angle is, the smoother and cleaner the cut will be. Models with higher bevel angles can cut composite materials including melamine or thin veneers. This refers to the width of the tooth in its widest contact, thus the cutting width. Thinner kerf were designed for finer woodworking, or for less powerful jobs usually performed by portable saws. Freud saw blades have always been received positively. This particular model, the SD208, is not an exception. At this point, it is very important to note that there are two versions available under this model. One comes with a black oxide finish, which is equipped with five chippers. Another model, which is readily available, is the chrome type finish which is referred to as the ‘Silver I.C.E. industrial chrome alloy plating’. This particular version is equipped with three chippers, as well as an extra 1/16” spacers which compensates for the other two chippers which is found on the previous model. This model comes equipped with (2) twelve tooth outer blades. They are alternated from a flat top tooth and a beveled tooth. They should also be installed using the upper point of the beveled tooth going towards the outer setup. This is what ensures the capacity of the blade to cut through different types of materials. This particular saw blade comes with (3) two wing chippers. These chippers come with a flat top teeth which are all designed to easily carve a flat bottom groove perfectly. Both the chippers and the outside blades are designed with an anti-kickback feature to further enhance safety. This feature is especially formulated and engineered by the manufacturer in order to optimize performance on the cutting tool. It uses cobalt, titanium carbide, as well as tungsten in order to come up with a blade that has the necessary sharpness to deal with any cutting task. This feature works in adding safety while using this tool. Accident usually happens when there is a ‘kickback’, the moment the trigger is released. This safety feature will help you save your fingers and limbs while cutting. This feature allows you to get the maximum performance, since it only means that the blade has the capacity to withstand several sharpening and still keep precision. This blade is available with a wide range of width options. It creates good quality and clean cuts. Built to last for a long time. Designed to create a flawless finish. Equipped with features that produces splinter-free cuts. The chart that goes along with this blade is not accurate. The Freud D1050X Diablo circular saw model is often described as a multi-purpose blade which can deal with ripping and cross cutting in wood and its composites. It is equipped with a huge gullet which offers enough space for efficient ripping. On the other hand, it has closely-grouped teeth which helps in achieving smooth cross cuts. In order to come up with long-lasting and strong resistance, this circular saw blade also uses a tough steel plate, as well as high-density carbide tips for overall performance. This blade is ideal for construction workers, contractors, as well as individuals who do DIY projects. The models’ clean cutting design only means that you have the opportunity to enjoy smooth cutting performance with this blade. It is equipped with a 0.98 kerf in between the 50 alternate-top bevel (ATB) of the blades, ensuring ease of feed and control over the position of the blade. This feature is often considered as a bonus. With laser cut stabilizer vents as a feature added to the design of this model, vibration and noise are reduced during the operation. As such, you can expect a more relaxed environment, with your hands in complete control of the operation. It also helps in reducing warping and friction, thus extending the cutting life of the blade. This coating is a non-stick feature which offers resistance to both corrosion and heat. This serves as the primary protection of the blades against these elements which may otherwise reduce its cutting life. This model is designed with durability in mind. This is made possible by the addition of a shock resistant carbide to the construction of the product. It also comes with hardy teeth that are well protected by this exclusive feature, helping in fighting and preventing wear and tear. This circular saw blade is designed to be very versatile. As such, it can fit various miters and table saws. As such, it is a perfect addition to your work arsenal. This circular saw blade traps vibration and noise. It has the capacity to keep itself cool while lessening blade warp. Designed to produce smooth cuts. Offers shock-resistance for longer lasting precision. More expensive compared to other models under this brand. Whether you are cutting softwood, hardwood, chipboard or plywood, this DEWALT DW3128P5 circular saw blade is the perfect option which can help you accomplish your task. It features two thin kerf as well as carbide blades, giving this set the edge over others. Both of the blades that are included in this set offers a wedge shoulder design which places an improved amount of steel at the back of each of the blade tip, thus preventing breakage, while ensuring accuracy and precision. This is together with the use of a computer-balanced plate which works in reducing vibration for a better feel and finish. With the use of a tougher tungsten carbide in this circular saw blade, it stays sharper even longer. As a result, you can also expect durability, and long-lasting cutting capacity of this blade. This circular saw blade is equipped with a thin kerf design which ensures smooth and fast cutting action. This feature works in reducing vibration. Vibration has the tendency to compromise the quality of the cut. However, since it is controlled, you can expect a better finish and improved accuracy. Versatility comes as a result of the inclusion of two blades in this set. One blade comes with 80 teeth, while the other one has 32 teeth. As such, you can choose the best one that is ideal for a given task at hand. This model is designed to last longer. Comes with a thin kerf design for a smooth and fast cutting operation. Two blades ensure versatility of this option. 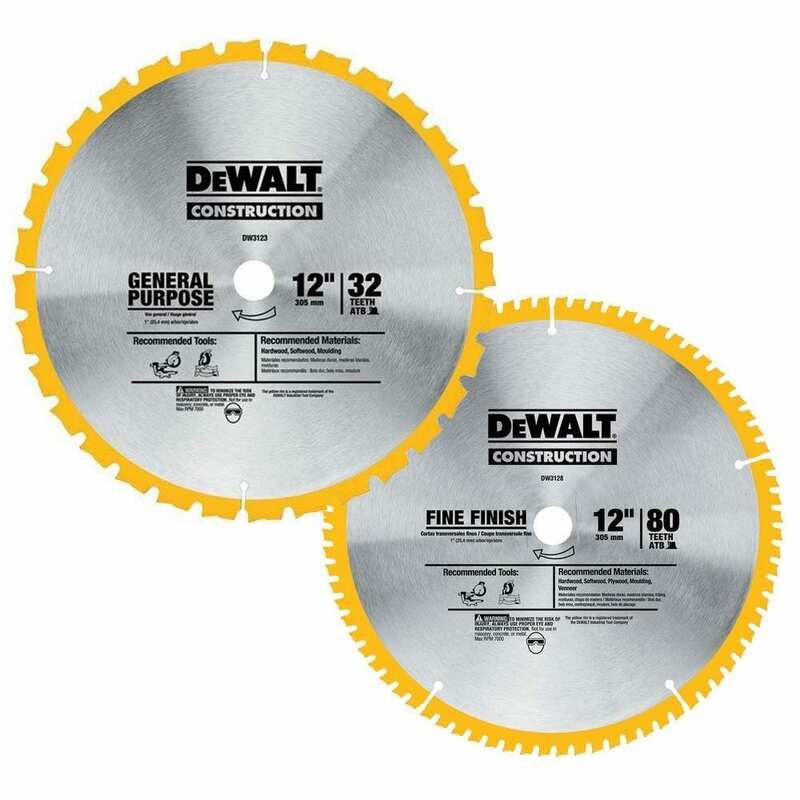 This circular saw blade comes at an affordable price. Some issues with the blade completing some ‘finish’ work. The Freud D0760X Diablo circular saw blade comes with an ultra-thin kerf design which is meant for easy cutting, as well as to ensure minimum waste while performing the cutting tasks. To ensure quality, this product has been especially manufactured in the United States. This circular saw blade also features a TiCo Hi-Density carbide which is especially designed for performing crosscutting applications. It is also equipped with several other features which make it a standout option for circular saw owners. As part of the purchasing protection of this product, this product is under the manufacturer’s Limited Lifetime Guarantee. Through the materials that are used in the construction of this saw blade, you can expect chip-free, clean cuts with a delicate finish work. In order to save your precious time, the cuts that are completed by this blade need minimum to zero sanding. The clean-cutting design of this model simply means that you can expect to enjoy the smooth performance offered by this blade. It comes with a thin 0.59 inch kerf that is situated in between the blade teeth. This can help in further maximizing the cutting accuracy as well as work efficiency. The inclusion of this material in the construction of this circular saw blade is specifically designed for crosscutting applications. This is the reason why this blade type is ideal for carpenters or woodworkers who operates a circular saw for this purpose. This technology is what makes this circular saw blade special. It reduces the level of noise expected, while extending the cutting life of this saw. This type of coating used on the blade reduces heat build-up and friction, adding to the life of the blade. This circular saw blade is easy to use. It is designed to reduce build-up of heat and friction, adding to the blade life. There is a tendency for the blade to wobble. 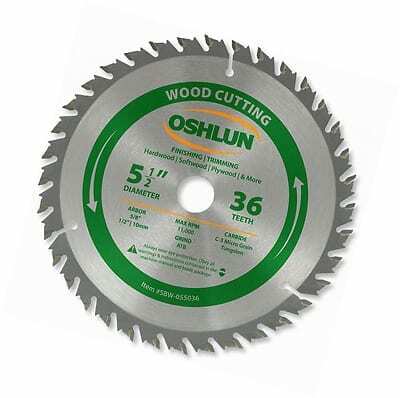 The Oshlun SBW-055036 circular saw blade is one that is known for its amazing performance. With its 0.6 inch arbor, it makes sure that it produces the cleanest cuts possible through board, hardwoods, softwood and hardwood materials. It also comes with an anti-kickback tooth designed that offers better safety features. Since it also comes with heat vents, the heat that is generated is dissipated during the entire cutting process. As such, the durability of the blade is extended. This micro grain carbide is long lasting, ensuring the smoothest finished cut. As it is also constructed with proficient grade carbide for smooth and faster cutting, the cuts are accurate. Accidents can happen in the workplace. One safety feature incorporated in this saw model is the use of anti-kickback tooth design. This means that this feature plays a huge role in providing protection to the user while operating the machine. The use of heat vents work in dissipating the heat that is build-up within the entire cutting process, extending the overall durability of the circular saw blade. This circular saw blade is highly compatible with other portable saws including brands like Craftsman, Makita, Skil and Ryobi. This blade is constructed using high grade carbide which makes it last longer. This saw blade is equipped with brushing in order to fit a wide range of saws. There is a tendency for the blade to tear off easily under extreme strain. One such customer commented that this saw is a real “multi-purpose blade”. As a combination blade, it is not just a mere jack of all trades type of tool, but it is a master of all. The 50 teeth that are incorporated with its design are able to cut cleanly across different types of materials. Another customer also said that this saw is the best “bang” for the money. This is an ideal sharp knife if you are in need for a flat bottom kerf. 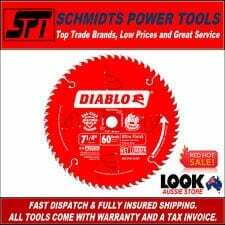 This is also a preferred option for individuals who are looking for quality and performance of saw blades, without unnecessarily hurting their budget. One customer, however, pointed the fact that this blade has the tendency to cut loudly. This may turn out to be a bother to some who are sensitive to noise. Aside from this, all other comments from different customers are praising the overall quality of this saw blade. The DEWALT DW9196 circular saw blade comes in an ultra-thin kerf design which ensures precision and speed in cutting. It is equipped with features that make it a viable option for carpenters and woodworkers. One of them is the use of an anti-stick rim that helps in reducing gum-up and friction. It also has an anti-kickback design which serves as an extra safety feature of the model. The 12057 cutting saw blade from PORTER-CABLE has a cutting capacity of 4-1/2 inch. It features an extended blade life which means that you do not need to constantly sharpen it during its cutting life. It is also designed in a way that reduces the need for completing final finishing. This blade model offers clean cutting of materials including veneers, plywoods, and others. 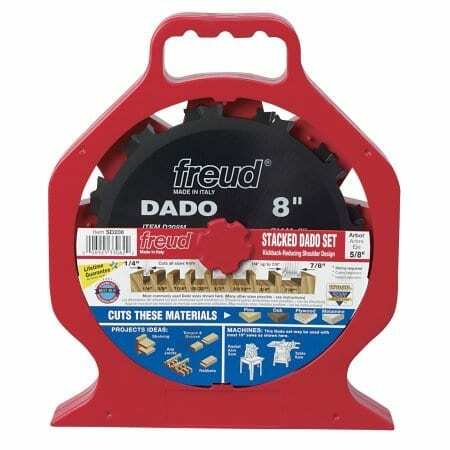 Freud D0624X is a Diablo designed framing saw blade. It uses the manufacturer exclusive TiCo Hi-Density Carbide for a flawless finish of the cutting task, as well as a longer cutting life of the blade. It is equipped with a super thin laser cut kerf which offers an extremely durable, fast, as well as clean cuts. Its laser-cut stabilizer also works in trapping vibration and noise which may otherwise result to disturbance while working. The ACB1000T100HP circular saw blade model from Concord Blades features a Triple Chip Grind. This features makes it possible the creation of smooth cuts, especially on plastic and nonferrous materials. The blade is ultra-sharp, and is made of hard titanium carbide. It is recommended for cutting materials including brass, aluminum, bronze, copper, and plastics. The Freud D12100X circular saw blade is particularly ideal for use together with miter saws. What makes it stand out from the rest is the use of a shear-face grind design which offers effortless cuts in a reduced amp draw on the equipment, thus resulting to less waste on material, as well as in maximizing tool performance. Evolution Power Tools 14BLADEST is backed up by the reputation of the manufacturer to create blades that offer maximum performance through the use of nothing but the highest grade hardened blade bodies, carbine, as well as ultra-high-grade techniques in brazing. This particular blade model has been designed for dealing with mild steel cutting. The Freud D1060X is another Diablo model of saw blade. As a product under Freud, it uses TiCo Hi-Density Carbide in the construction of the blade, thus resulting to a longer cutting life, while ensuring a flawless finish of the cutting task at the same time. Its super thin laser cut kerf also offers extremely durable, fast and clean cuts. Diablo D0641X features an ultra-thin kerf design which means the creation of effortless and fast cuts, under the use of the manufacturer’s TiCo Hi-Density carbide. Aside from performance, it also assures extreme durability, as well as an extended cutting life which reaches up to 4 times longer compared to other models that use the regular carbide material. It also comes with a Perma-Shield Coating which results to less gumming, dragging and corrosion. The DEWALT DW3196 finishing saw blade is constructed using tougher tungsten carbide which ensures that the blades stay sharper longer, reducing the need to constantly resharpen them in between tasks. Its thin kerf design ensures smooth and fast cutting action. It is also equipped with ribbed heat vents which allow the blade to perform and operate cooler, thus reducing the possibility of blade binding and flexing. Rockwell RW9281 comes with 24 carbide tipped teeth, thus making sure that the blades last longer. It is also ideal for cutting plastic, wood as well as other composite materials. This particular saw blade is designed to work with a specific model of circular saw, the RK3441L Rockwell model. Looking for the most appropriate circular saw blade that can be used for an equipment can be tough, but manageable. This is true when you are equipped with the needed knowledge to make the wisest purchasing decisions. The options that are presented above give you the overview of what to expect out of a certain model. Choosing the best saw blade is a matter of making sure that it fits well with your circular saw. Since there are different types available, make sure that you are familiar with your tool, to ensure that you are getting the right one required for it.